Fewture Getter 2 is the third figure to be released after Fewture Getter 1 Black (a rare limited edition) and Fewture Getter 1 (red, regular edition). This figure you’ll find has some balance issues. It’s not horrible or impossible to have a free standing pose on this figure, but I wouldn’t advise displaying the figure without support. But the balance varies on what you display with. With Getter 2 having its chest cavity open, it is very unstable. 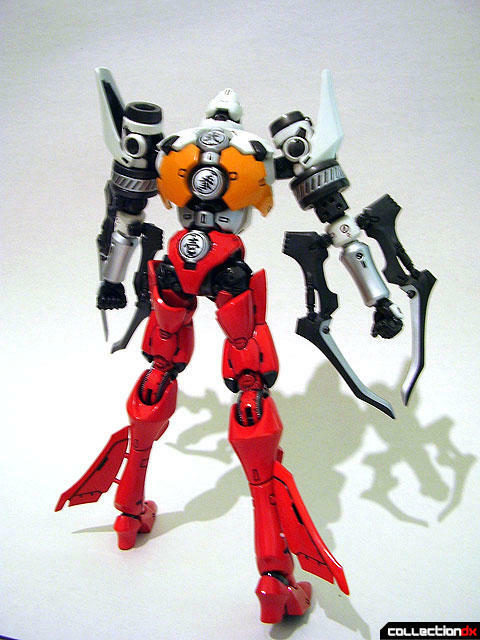 Getter 2 was definitely balanced with the chest plate on. 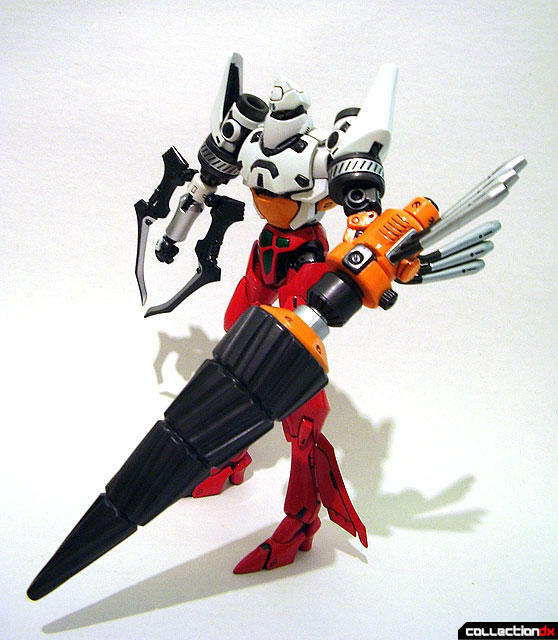 Displaying the figure with the drill arm (either the large drill bit or the small one) stabilizes the balance quite a bit, versus both regular arms. Getter 2 has some really small issues that I’ll just point out in this section. The Chest plate on this figure is very difficult to put on. 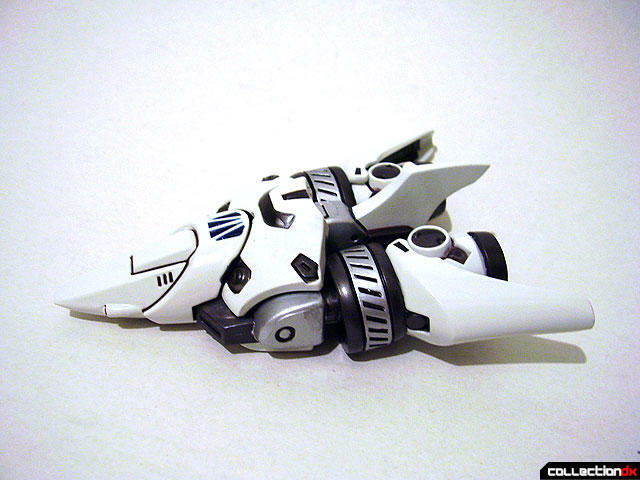 On Getter 1, the chest was very loose. They must have over compensated on Getter 2. The chest fits a little bit too tight, and you will need to put some gentle force to put it in. Another small issue is in the difficulty of opening the secret compartment in the hip. 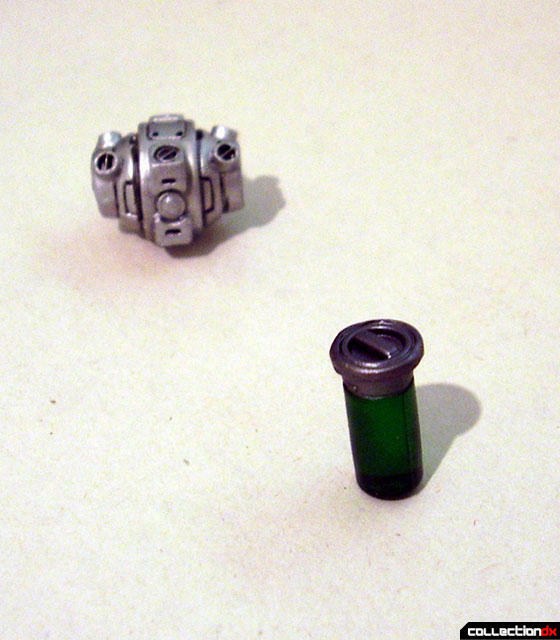 The instruction manual that came with the figure clearly shows that there is a compartment. But I fear to investigate any further may cause damage to my hip plate. 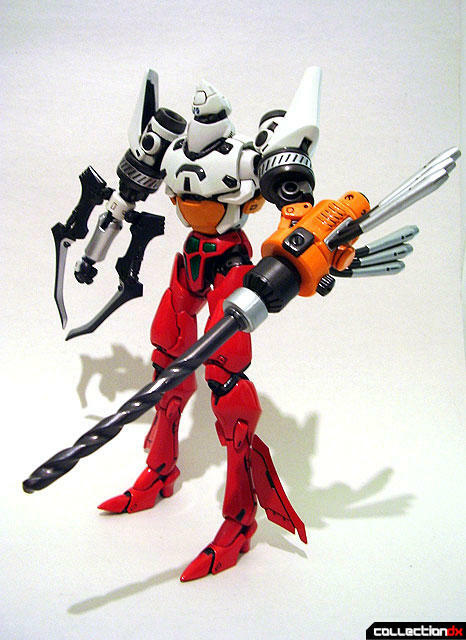 On another note, be careful when you pick up your Getter 2. The mid section or spine part is only made out of plastic. Though the plastic is fairly strong, you may want to avoid any chance of cracking or snapping. Aside from these faults, there are still a lot of pluses (this time round I’m finding the faults of Getter 2 are far fewer then Getter 1. The design is very striking. Taku Sato outdid himself when designing this figure. It has a nice balance of the classic design, but still able to have a modern industrial look. 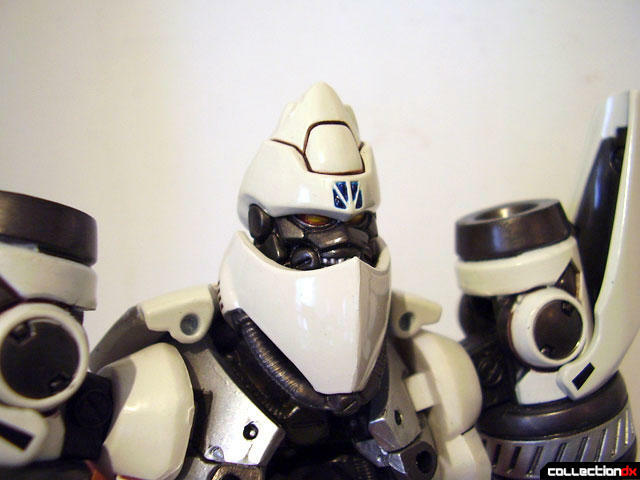 The chest plate and face plate on this figure are removable, to reveal the inner skeleton. Specific details like these make this figure stand out. The amount of diecast in this figure is quite clear the moment you pick it up. It’s heavy, plain and simple. There is some plastic but it’s solid and sturdy. The paint job is quite nice too. The paint job seems able to withstand any normal scratches you might get from playing. 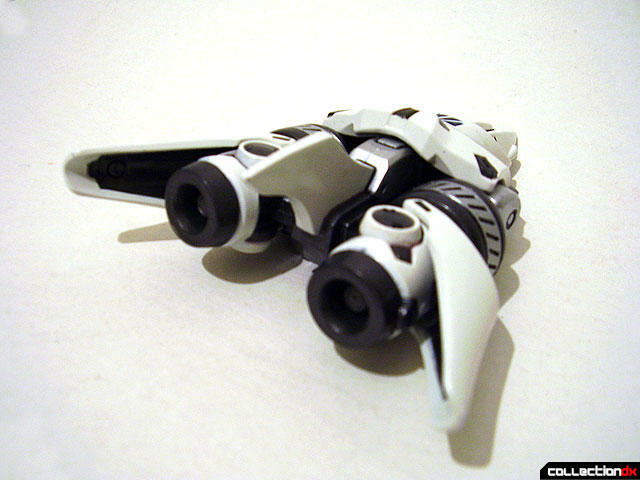 Most of the hinges are ratchet jointed and hold firm when posing, so you won’t see any loose joints over time. The pose ability in the thighs has a greater range then Getter 1. This helps balance it a little better on its very thin feet. 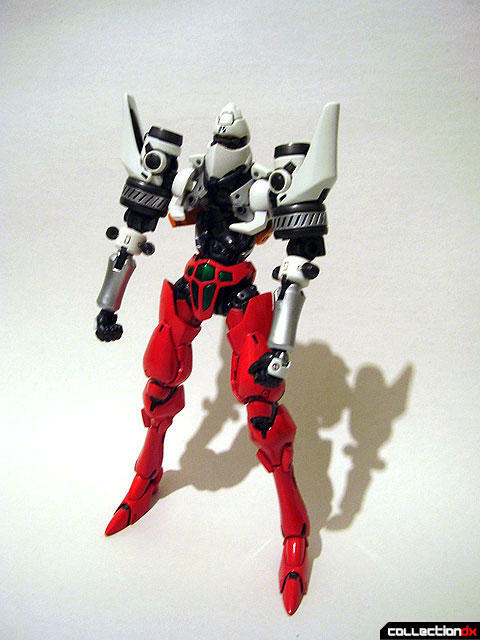 Overall there are a lot of small technical improvements that they’ve made over Fewture Getter 1. 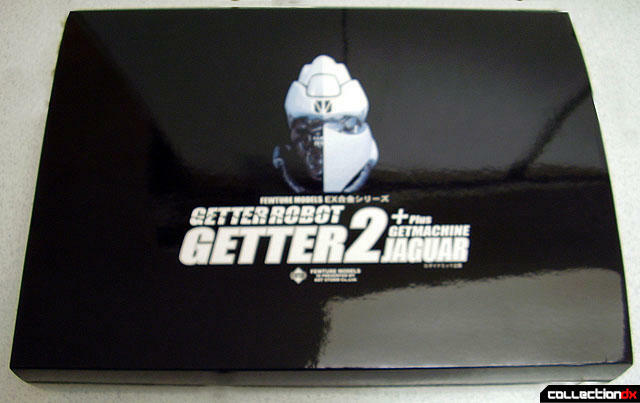 Getter 2 also includes the Getter 2 machine Jet. Even though it plays second fiddle to Getter 1 machine, its quality is equal. It’s mostly diecast, and fairly heavy. There’s very little gimmick to it. 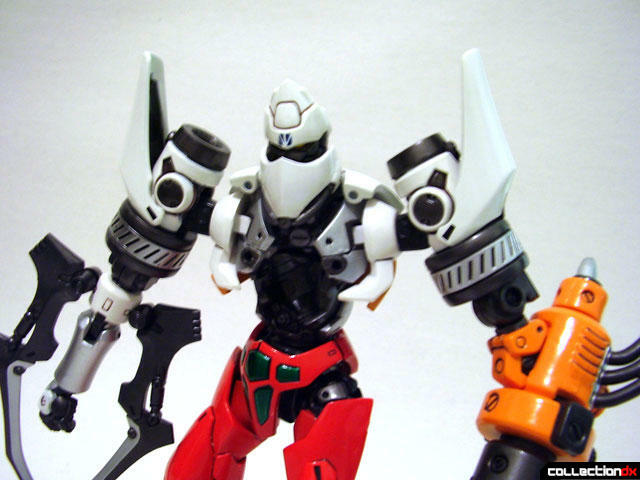 The most is you can do is pop the fists into the back of the engines (arms, and they have elbow joints) to replicate the forming of the upper torso. Though simple, it has a nice touch. Overall it’s a very high quality figure, if you can afford it; I would recommend getting this figure. Getter 2 had a limited production run of 2,500 units.